Keep up with your baby's abundant wardrobe by sewing hats to match each outfit. While winter hats are common, babies also need summer hats to keep their faces and heads protected from the sun. 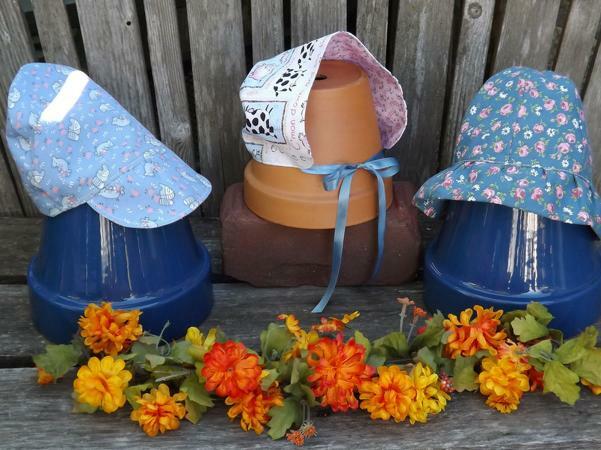 Try one of these designs to sew a lovely and useful hat for baby. Each of the following hats is sewn using a 1/4-inch seam allowance throughout unless otherwise stated, and can be completed in under 30 minutes. The amount of cut yardage has been given in the supply list but scrap fabric can also be used. If your fabric feels too light to hold the shape of the hat, cut additional pattern pieces using fusible interfacing. Simply iron them to the back of the fabric pieces and sew as instructed. Download and print the PDF patterns for each project by clicking on the pattern images. If you need additional help with downloading the PDF pattern, try these tips. 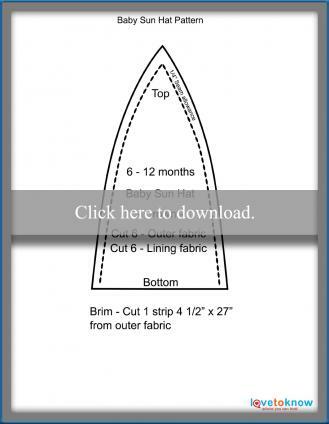 This sun hat pattern size is 6-12 months. The circumference measurement is 18 inches. Light or medium weight fabrics are recommended for this pattern. Print out the pattern and cut out the pieces. Cut six crown pieces from the outer fabric and six crown pieces from the lining fabric. Cut one strip 4 1/2 inches wide by 27 inches long for the brim. The crown pieces are sewn along the sides, from the bottom edge to the point indicated on the pattern at the top of the crown. With the right sides together, sew each of the outer crown pieces together using a 1/4-inch seam. Repeat with the lining crown pieces. Press the seams to one side. Baby sun hat crown and lining. Fold the brim strip in half with the long edges matching and the right side facing out. Press the fold. Open the fold. Bring the two short ends together with the wrong side facing out. Sew the short ends of the strip together using a 1/4-inch seam allowance. Press the seam open. You now have a ring. Refold the long edges together and re-iron the fold where you stitched the seam. Hand sew the long raw edges of the brim together using a long running stitch. Turn the stitched outer crown right side out. Slip the brim over the crown. Pull the thread of the running stitch to gather the brim. Adjust the gathered edge to fit the opening of the crown and pin. Evenly distribute the gathers around the crown. Baste the pinned edge to hold in place. Attach the sun hat brim. Place the wrong-side-out lining crown over the outer crown and brim. Match the edges of both crown pieces with the brim sandwiched in between. Pin the edges together. Sew around the pinned edge leaving a 3-inch opening. Turn the hat right side out through the opening in the crown edge. Press around the edge at the seam between the brim and the crowns. Pin the opening closed. Top stitch around the crown, just above the brim. This finishes the hat while also closing the opening in the crown. Click to download the sun hat pattern. 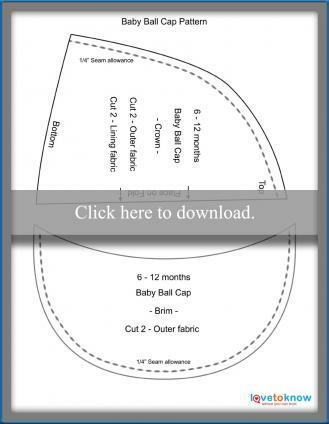 The ball cap pattern size is 6-12 months. The circumference measurement is 18 inches. Medium to heavy weight fabrics are recommended for this pattern. Download and print the pattern; cut out the pieces. Cut two crowns from outer fabric, two crowns from lining fabric and two bills from outer fabric. Place the two crowns from outer fabric together with the wrong sides facing out. Sew the pieces together where indicated on the pattern using a 1/4-inch seam allowance. Do not sew across the bottom. Repeat with the lining crown pieces. Place the two bill pieces together with the wrong sides facing out. Sew the edge where indicated on the pattern using a 1/4-inch seam allowance. Trim the seams of the crowns and the bill to 1/8 inch. Cut and sew the crown, lining and bill. Turn the outer crown and the bill right side out. Press each piece at the seams. Top stitch the bill 1/4 inch from the edge along the seam. Place the right-side-out outer crown on your work surface. Lay the bill on the crown. Match the unstitched edge of the bill on one side of the crown. Center and pin the bill to the crown edge. Baste the pinned edge to hold in place. Insert the outer crown and bill inside the wrong-side-out crown lining with the bill sandwiched in between. Match the side seams and edges of the crown and pin. Sew the pinned edge using 1/4-inch seam allowance and leave a 3-inch opening in the back for turning. Turn the cap right side out through the opening in the crown edge. Press around the seam edge. Pin the opening closed. Turn cap right side out. Top stitch around the crown as close to the crown edge as possible. This finishes the cap while also closing the opening in the crown. Click to download the baby ball cap pattern. The reversible baby bonnet pattern fits sizes 3-12 months. Light, medium or heavy weight fabrics can be used for this pattern. Download and print the pattern for this project, then cut out the pieces. Cut a bonnet piece from two coordinating fabrics. One will be Side A and the other Side B. Note: Each bonnet piece measures 8 1/2 inches wide by 14 inches long. Place Side A on your work surface with the right side facing up. Cut two lengths of 3/8-inch-wide ribbon, 15 inches long. Pin one end of each ribbon on the bottom-sides of Side A, 1 1/2 inches from the front. Stitch the pinned ends to secure. Pin the excess of the ribbons to the center of Side A to keep them from becoming stitched into future seams. Place Side B on top of Side A with the right sides together. Pin around all edges. Sew around the pinned edges using a 1/4-inch seam allowance. Leave a 3-inch opening along the center back and 1/2-inch openings from the back seam, along the bottom-sides. The 1/2-inch openings will be the casing openings. Trim the bonnet around the corners. Turn the bonnet right side out through the opening in the back. Press the bonnet. Top stitch along the back edge of the bonnet as close to the edge as possible. Measure 1/2 inch up from the top stitching line. Sew along the 1/2-inch measurement to create the casing. Continue to top stitch from one casing line, around the bonnet to the other casing line. Cut a 15-inch length of 3/8-inch-wide ribbon. Attach a safety pin to one end. Feed the ribbon through the casing with the ends extending from each end. Form the bonnet back by tightly gathering the ribbon in the casing and tying the ends into a bow. Form the back of the bonnet. 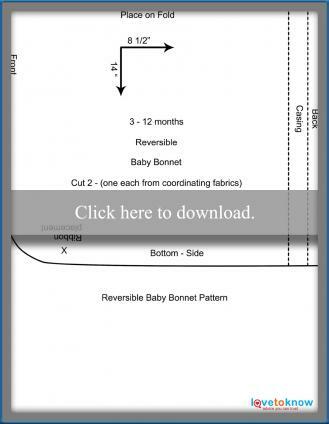 Click to download the reversible bonnet pattern. The size for each hat will give you a loose to snug fit during the growth period stated for a baby's average measurements. Adjustments to the hats can be made for a better fit during the growth period. A simple way to temporarily adjust the hat is to fold a small section at the back of the crown and pin with a safety pin. This will provide a longer period that the hat will be wearable before being packed away. Another temporary fix is to gather a small section at the back of the crown using needle and thread. As baby grows, clip the thread and gather again, accommodating the larger size. A permanent adjustment could be done during construction of the hats. The sun hat and the ball cap adjustments can be done at the bottom of the crown pieces. To figure adjustments, measure the circumference of your baby's head. For the sun hat, divide the total by six and add 1/2 inch (total of two seam allowances). Change the bottom of the crown pattern to your new measurement and adjust the sides of the pattern to fit. For the ball cap, divide the baby head measurement by two and add 1/2 inch. Change the bottom of the crown pattern and adjust the sides. The bonnet should need no changes to the pattern. There always seems to be someone you know expecting a baby or grand-baby. Stay one step ahead of the shower invitations with a stash of baby hats ready for gift giving.